My old friend, Danny, much more techno-savvy than I will ever be, suggested recently that I might want to consider buying a Kindle, the digital book reader that it sold by Amazon.com. The Kindle can hold something like 1,500 books (out of a quarter million available and growing). It’s amazing: it can talk to you when your eyes tire, you can download from anywhere, and you can even make digital marginalia. It weighs less than a paperback book and its thinness is a boon to the traveler. For a guy (me) who is forcing himself out of his own house with his addiction to buying books, it seems like a life raft. Only one problem—its not a book. I love the kinesthetics of books, the sort of solid, woody feeling that have in one’s hands, the little drumming sound you get when you tap on them. I love their smell, texture, the way stuff gets stuck in their pages, or you can put stuff—postcards, boarding passes, and little notes—in their pages. I like writing in margins. I like the smell of them. When I write my own books the first handling of them is like a new baby, like your mind being given substance. I love to look at my shelves of books, remembering those I have read and indulging myself with the thrill of selecting the next one. I like books that have been read by others, that have been handled and have little marginalia or inscriptions. I like putting my name and chop in my books, possessing them. (See, DCJ Archives 23.5 Ex Libris) These are old habits; I don’t know if I am ready for the clean, efficient antiseptic Kindle. 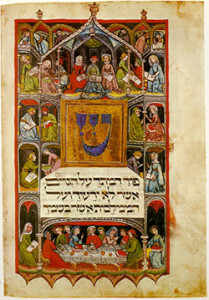 People of the Book is a book about a book, the Sephardic Sarajevo Haggadah. Brooks, Australia,, a former journalist and Pulitzer winning author, must like books, too. This is a novel, but it is about a famous book that—and this is the essence of the story—was imperiled many times in its history, before it ended up in a museum in Sarajevo, and makes (I won’t spoil the mystery of the story) its final journey. It’s a book that crosses over from its origins in the Spanish la convivencia, into the hands of an inquisitor priest in Venice, ends up in Vienna in WWII and finds its way to Sarajevo. 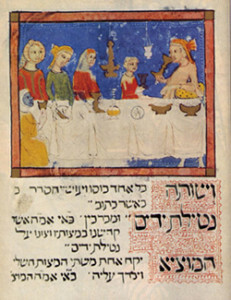 Brooks takes her story from the existence if the actual Haggadah, the Jewish seder narrative. In this case, it is an exquisitely, and mysteriously, illustrated haggadah, that Brook’s protagonist, Dr. Hanna Heath, a rare book conservator, its engaged to restore and authenticate. Clues to events in its diasporic life from it departure from Southern Spain in the Expulsion, to its eventual “destination” consist of wine stains, salt crystals, a hair from a paintbrush and a fragment of a moth’s wing. If Heath’s investigations were all there were to this it would be just a version of CSI, with an old hook as the corpus delicti of outrages againstquattrocento European Jewry. But each clue is imbedded in an evocative and richly-textured return to the period and personalities of the provenance of the haggadah. Heath herself is no mere narrator, but has her own tortured personal journey that lends an added layer if suspense to the story. The Sarajevo Haggadah comes into history at a time when books certainly had a more powerful mystical grip on people’s minds. Very few people who literate, and at least the Roman Catholic Church preferred it that way; it would be the guardian of interpretation, especially of scripture. (For a long time, priests were the only ones in man small communities who could read; once more people became literate the prelates apparently turned full-time to pederasty.) An illustrated manuscript opened the possibility for wider, and more subjective interpretation of meanings. All sorts of hidden messages might be hidden in various signs and symbols. At any rate, illustration was more “connotative,” hence more subjective in its result. Of course, being a Jewish book, written in Hebrew characters, would make such a publication suspect in a world in which the contending supermetaphysical powers seem to regard the Jews as people on which to practice their nastiness. Springing from the Abrahamic soil as they do, Christianity and Islam seem at times in a brotherly contest to commit patricide. 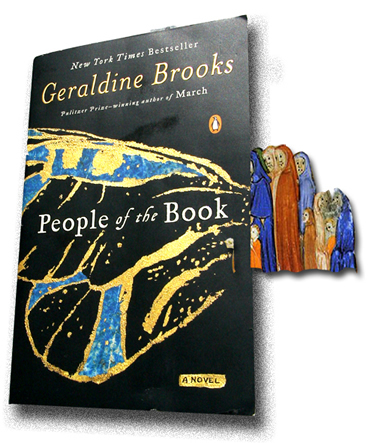 Although it is about a famous illustrated manuscript, in reading Brooks’ book one must rely upon her descriptive abilities to conjure an image of what it looks like. Her decision not to illustrate her own book might have been intentional, or she might rely on the fact that most of her readers would likely have seen some of the books of hours and other illustrated books from the Middle Ages. Then again, she might not have wanted the image of the actual book to detract from the fascinating descriptions of the craft of rare book restoration and preservation. In any case, one can, in these days, go to the Internet and, click, click, click, voila! 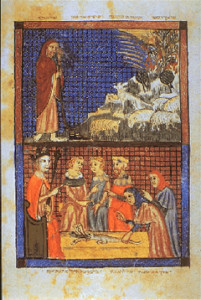 Sarajevo Haggadah. And here we can appreciate that this precious little book is illustrated (although “illuminated” is frequently the word used) in pre-Giotto style. Faces are stylized, but much attention is given to other details—clothing, architecture and decorative elements, historical events, calligraphy, and ceremony. We live in age of image bombardment; we see, whether we wish to or not, thousands of images every day. Such inflation might cheapen individual images, but the image has not lost its potential power. For one thing, as we know with the photo and motion pictures, images pass through the membrane of cultural boundaries where words become snagged in language differences. The power of the image was doubtless recognized quite early, maybe as far back as the pre-historical cave illustrations at Altamira, not all that far from where the Haggadah was “illuminated.” The image was the first human form of communication after language, the form that answered the question, “what did it look like?” Brooks relies in her verbal description, but I will cheat a little bit for the people of the Journal.